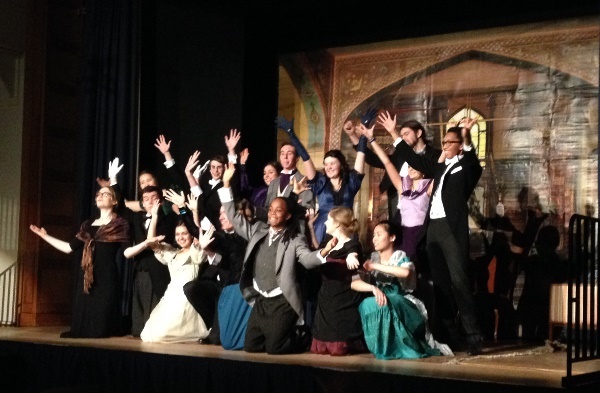 Last night’s performance of Oscar Wilde’s comic masterpiece was a triumph for all concerned. It is remarkable that a school as busy as Purcell, where pupils are constantly in demand for rehearsals, concerts and competitions, can manage to put on a dramatic production of such quality. All the actors adapted well to the mannerisms of the period, helped by excellent costumes – proper evening dress for the men, and some delightful frocks for the girls. There were many hilarious moments, especially from Joe Parks, Tom Sparkes, Matthew Higham, and Kyle Fearon-Wilson, but even more touching ones, particularly those between the three main protagonists, beautifully played by Sam Every, Victoria Gill and Emily Brown. Many congratulations to everyone involved, and particularly to Mr Paul Elliott for directing a most enjoyable evening.